A broken home, an alcoholic and abusive father, a fierce divorce battle betrween his parents when he was 13 all conspired to thrust Randy Hogue into years if drug addiction and ultimately a failed attempt at suicide. But then came JESUS! Randy was saved at Baptist Temple in his hometown of Indianapolis, Indiana. After being educated at Baptist Bible College in Springfield, Missouri, he began a ministry of full-time itenerate evangelism. Over 35,000 people have been saved at his evangelistic events, church and area-wide crusades, student conferences, and youth camps. Randy has preached over 1,200 meetings with the participation of over 750 different local churches. He has preached in 46 state and 22 foreign countries, including, China, India, Russia, Phillipines, and a current ministry to the Communist nation of Cuba. Randy and his wife, Cindy have a 9 year-old son, Will, and a 6 year-old daughter, Abby. 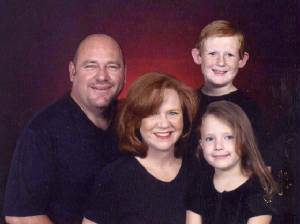 They live in Cindy's hometown of Cullman, Alabama, where they are active members of Seventh Street Baptist Church. Randy is excited about the potential harvest of unbelievers during these last days. He is especially sensitive to the desire of the pastor and the need of the Church. With a servant's heart, a contagious spirit, a powerful message, and an extrememly effective gift to communicate and relate to young and old alike, the hand of God is upon Randy's ministry.